The Raft Cove Provincial Marine Park is a great place to find Starfish, anemones, and a variety of small tidal pool life forms. Situated on the West Coast of Vancouver Island, Raft Cove has many rocky outcrops which are pounded by the Pacific Ocean. As the tide recedes pools are left in small indentations in the rocky outcrops where starfish await the next high tide and new supply of ocean nutrients. 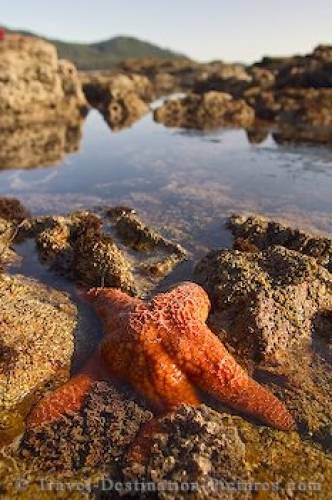 Most starfish have five or six arms which stiffen when you try to pry them off the rocks. The Sunflower Starfish breaks the mould, and has approximately 20 arms which move freely across the surface. After a 45 minute hike into Raft Cove it is always a pleasure to spend some time combing the rocks at low tide to see the marine life contained in the temporary pools including various coloured starfish. on Vancouver Island, BC, Canada.